Chris Grayling has just announced today (12th October) around £48bn spending on the rail network from 2019-24 to improve services for passengers. The funding comes on top of record rail funding over the past 5 years as the government delivered the biggest rail modernisation programme for over a century. The predicted doubling of passenger numbers in the next 25 years is the biggest challenge facing the railway industry.Meeting this challenge will mean successfully delivering major upgrades to the existing railway to allow more and longer trains to run, as well as contributing to the development of new lines such as HS2 and Crossrail 2. The Western route out of London Paddington, the East Coast main line out of London King’s Cross and Wales are parts of the railway where Network Rail and the train operators have now formed joint Boards and introduced an independently chaired supervisory Board, with passenger representation, ensuring the different bodies work together to drive improvements. Over the next 18 months passengers will see a transformation as thousands of improvement projects across the country are finished and thousands of new services and new fleets of trains are introduced increasing rail capacity into many of our major cities by 20-30%. 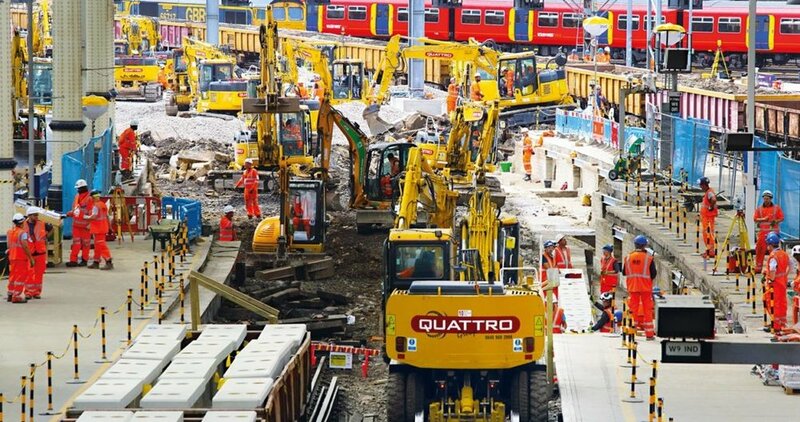 Sandhurst was proud to be part of this operation, supplying rail equipment for the work. When it came to finding a plant hire company up to a project of this scale and size, only Sandhurst was able to meet the brief and supply the quantity of high-performance equipment required on site on time; a range of breakers, rotating grapples, EMV piling hammers, and log grabs. Whatever the size of our customer or project in hand, Sandhurst will always supply the very best attachments, serviced to Sandhurst standards, on-site, on time.